New for February 2011! We have more discussion of "floating FETs for positive bias control", see below. Here we will compare driver circuits for PIN diodes with those needed for switch FETs. The driver circuit that is needed for PIN diodes almost precludes the use of this technology on volume-limited applications such as T/R modules , where element spacing is less than the width of available diode driver circuits. Because of the complexity of designing a high-speed current driver circuit, the FET switch typically has an advantage in switching speed as well. National Semiconductor offers a monolithic solution for driving PIN diodes, DH0035. We have no experience with it. 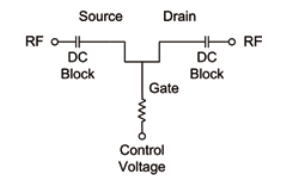 CMOS-type gates are often used to drive FET switches. The HCT logic family makes a good choice, such as the 74HCT04 hex inverter, available at DigiKey. This device switches in about 10 nanoseconds, and the gates can be daisy-chained to provide the complimentary signal voltages that many FET switches require. The feature that makes the HCT series a good bet for switching FETs is that the outputs operate almost to the voltage rails, which will give you the best switching performance. Note that HCT only operates reliably at 5 volts, so don't use this stuff if your switch needs seven volts to switch. If you need higher voltage levels, try the CD4041 quad complimentary buffer. The CD family can operate up to 15 volts. However, switching time is on the order of 100 nanoseconds. Ordinarily a FET switch will need control voltages of 0 and -5 volts. "Floating" a FET switch to change to positive logic (0 and +5 volts) can be done in two ways. One solution is to bypass the individual FETs and add DC blocking caps to the RF terminals. This can be done either on-board the chip (the most elegant solution) or off-board. The result is that the FETs are RF grounded but a positive DC voltage is injected. 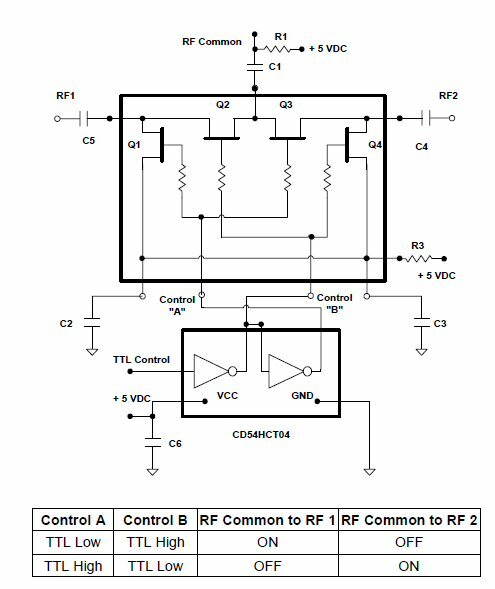 This is illustrated in the figure below; we borrowed it from M/A-COMs app note S2079, Drivers for GaAs FET Switches And Digital Attenuators. There a funny mistake on this app note figure which we must point out after all these years... The 5VDC connection to FETs Q2 and Q3 is on the wrong side of capacitor C1. Doh! A friend asked us a great question from this schematic. If you actually hooked it up like this, would it work? The concern is that when Q1 and Q3 are off, Q2 would have no path to the bias voltage, and similarly, when Q2 and Q4 and off, Q3 also has no reference. You know what? It will work anyway! Here's what happens, Grasshopper: when a FET is OFF, it is still slightly ON. Indeed, a 1 mm FET might leak 1 mA when pinched off at -5V. When you observe the IV curves you would not notice this unless you zoomed in. If it is leaking 1 mA, it behaves like a 5K resistor. This is more than enough conductivity to bleed off any trapped charge on the "isolated" FETs Q2 and Q3 when you switch back and forth, but if you were looking for the fastest switching speed, you might want to put a voltage on R1 but hook it to the correct side of C1. Time for two more Microwaves101 Rule of Thumb! You should plan on the off-state resistance to somewhere between 5000 ohm-mm and 50,000 ohm-mm. In most designs you can just ignore it, but in the example we just cited, it's important. The minimum size for a gate choke resistor is on the order of 500 ohms. Many designers use thousands of ohms, this merely slows down the switch. The gate is already (at least partially) decoupled from the RF without the resistor! Some day we'll add an analysis to back up this bold statement... For very high speed, you can eliminate the gate choke resistor by using a low impedance bias network (quarterwave stub terminated in a capacitor for example). The second method to achieve positive bias control is to float the entire switch. For a surface mount switch, this means that instead of grounding the device through via holes you need to RF ground it through an appropriate capacitor(s). You will still need DC blocks on the RF ports. Either method of floating a switch adds an additional terminal to a switch, and a high-pass response results from the DC blocking capacitors that are required. New for January 2016: how much should you worry about floating nodes in a switch design? This is in response to questions sent in by Chris.